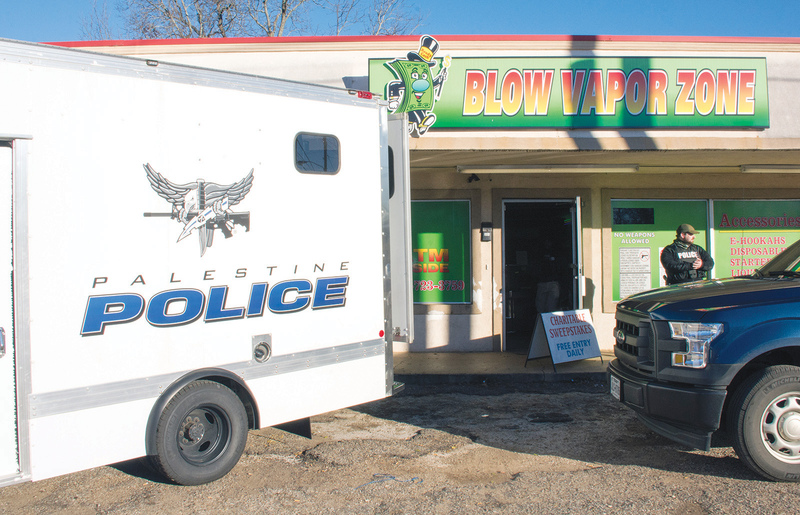 Officials with the Palestine Police Department raided three gaming establishments in Palestine, including the Blow Vapor Zone, located at 301 W. Palestine Ave., after finding evidence of illegal operations. Courtesy Photo. PALESTINE – The Palestine Police Department and City of Palestine officials ain’t playin’ around about illegal gaming! Officers with the Palestine PD conducted raids of three gaming establishments located within the city limits on the morning of Friday, Jan. 12. According to Nate Smith, Communications and Best Practices Officer for the City of Palestine, the locations included Blow Vapor Zone (301 W. Palestine Ave.), Dee’s Business Center (300 W. Palestine Ave.) and J&R Lounge (515 McNeil St.). Anderson County District Attorney Allyson Mitchell expressed pride in the Palestine PD and the efforts they made during the raids. Palestine Police Chief Andy Harvey explained that the investigation (nicknamed Operation Game Over) of the locations was carried out by officers throughout the month prior to the raids. According to Chief Harvey, the locations addressed during the raids are the three most active gaming facilities in the city. Chief Harvey explained that throughout the course of the month, undercover officers with the Palestine PD visited the game rooms and played the games to familiarize themselves with the operations of the establishments. Chief Harvey briefly described his firsthand experience with robberies and murders which have occurred in gaming establishments. Chief Harvey also cited the possibility of wider spread crime as a concern leading to the investigation. Chief Harvey estimated that roughly 150 machines were seized from the three locations, while the amount of cash recovered could range from the tens of thousands up to a total of $100,000. While machines and money have been taken into police custody, no arrests have been made. Chief Harvey echoed the sentiments of Mitchell regarding his pride in the department and the belief that a clear message has been sent to other gaming facilities which may still be operating in the city.